Photo by Peter Zaharis from the 1956 Ipswich Town Report. Before introduction of the Salk polio vaccine in 1955, there were tens of thousands of new cases of polio annually in the United States, many resulting in paralysis. In the following year, new cases had been cut in half, and by 1961 there were just over 1,000 people infected. Since 1979, no cases of polio have originated in the United States. Camp Sea Haven was constructed on Plum Island in 1947 for children who had polio. As the epidemic disappeared, the camp welcomed children and young adults with other crippling diseases. 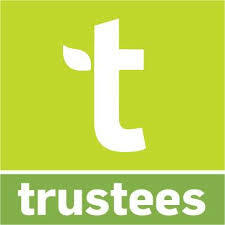 In 1972 the Cerebral Palsy Foundation took over the camp; it closed in 1988. 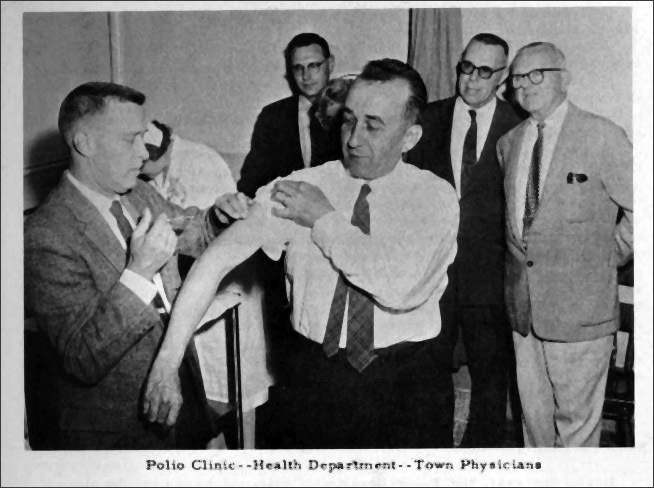 In 1955 Ipswich and other Massachusetts communities adopted a polio inoculation program in which 242 first and second grade Ipswich children were inoculated with the Salk vaccine. In 1956 twelve clinics were established in Ipswich, with 2140 children and adults receiving inoculations. 3146 residents received the vaccine in 1957, including 1367 adults. All school children were inoculated at school clinics. 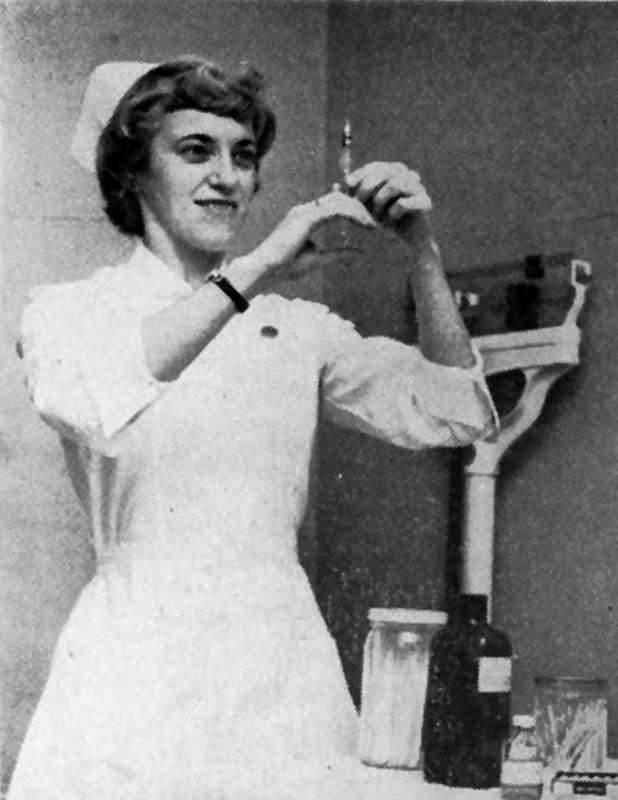 In 1962, 5756 Ipswich residents received the oral Sabin vaccine. At the polio clinic at Winthrop School in 1963, 5175 people were given the oral medicine. In the following years, a wellness clinic was held each month at Winthrop School in which infants and pre-school children were immunized against polio, diphtheria, tetanus, whooping-cough, and measles. Vaccination was free of charge to all persons. (Source: Ipswich Annual Town Reports, 1955-1963). I grew up a day when, save for diphtheria, there were literally no inoculations for childhood diseases. There was no going to your Ipswich family doctor to receive a shot or vaccine to keep you from getting measles or mumps. No, the only real method for becoming immune to any of the common childhood diseases was simply to contract it, and during a several year period I managed to contract them all: whooping-cough, mumps, scarlet fever, measles, chicken pox. In fact, it was not unusual for parents to intentionally expose their children to someone with one of the milder contagious diseases and when I came down with chicken pox two kids from next door were sent over to play with me. But while this was the case for many childhood diseases there was one that everyone feared and no one wanted to contract: polio. 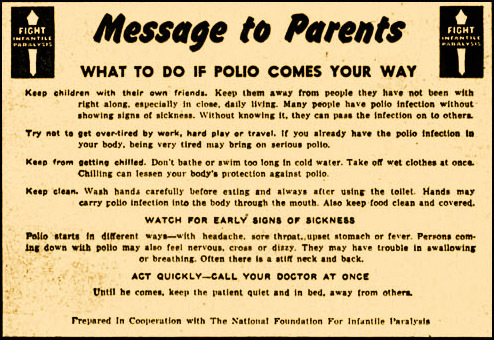 I remember it was the summer of 1949 when the threat of a polio epidemic was first brought home to me. Why this particular summer I’m not entirely sure. The US had experienced polio epidemics before, the first recorded as far back as 1894 when over 130 cases were recorded in the state of Vermont. Now it is true that by the end of 1949 polio would end up causing over 2700 deaths, but the worst was still to come. The peak would not be reached until 1952 when nearly 58,000 cases of polio were recorded in the US with 3,000 of these ending in death and another 21,000 victims left with mild or disabling paralysis. Infantile paralysis as we referred to the disease before the term polio, short for poliomyelitis, entered the popular lexicon, was originally thought to affect primarily the young causing the paralysis of the muscles in their lower extremities. For some, however, the early stages of the disease were marked by a paralysis of the chest muscles making it impossible to breathe. It was at this stage that most deaths occurred unless the patient had the good fortune of gaining access to an iron lung; typically a person aided by an iron lung could begin breathing independently within two to three weeks. 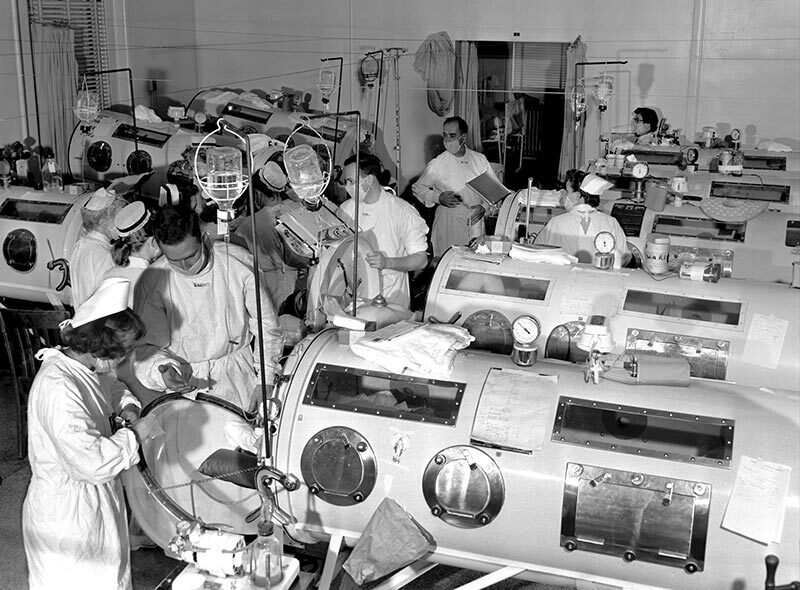 Polio ward with iron lung respirators at Haynes Memorial Hospital in Boston, 1955. Photo courtesy The March of Dimes. By 1948 most people knew the late President Roosevelt had contracted polio as a young man and as a result had been paralyzed from the waist down though during his years as president he had refused to be photographed in his wheelchair. For that reason many Americans were unaware of his disability until some years after his death. Ironically, this had not stopped FDR from establishing the March of Dimes, a foundation whose single mission was to raise money to fight and eventually eradicate this dreaded disease. Children especially were enlisted to aid in the fight. We would either contribute dimes ourselves or we’d solicit dimes from townspeople that we’d put in collection cards especially designed for that purpose. These dimes, or at least those minted after 1946, even bore FDR’s image, memorializing his efforts to combat this disease. But even by the late 1940s it was still not well understood how polio was spread. The disease was recognized as being highly contagious so all of us were warned to stay away from crowded venues. Children in particular were discouraged from going to the movies or attending carnivals or sporting events. The belief also took hold that the poliovirus might be found in water, or at least it could be spread more quickly through water. 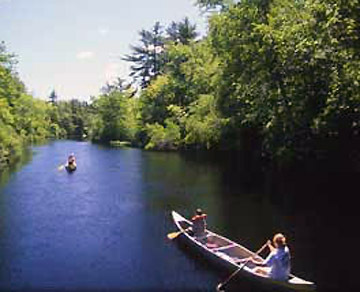 As a result everything from public swimming pools to beaches and even one’s favorite swimming hole became off-limits. Our justifiably worried parents took away our most enjoyable summer pastime. So it was that my mother decided if she had anything to say in the matter I would not contract polio; in that she was absolutely adamant. So on the very first day of summer vacation she made it painfully clear that I would not be allowed to go to the movies at the Strand; nor could I even to go downtown. There would be no going to Crane’s Beach nor would I be allowed to play in Miles River that ran along the edge of our property on Lakemans Lane. For all intents and purposes I had been quarantined for the summer. If my other friends had such prohibitions forced upon them I probably wouldn’t have felt so bad, but they hadn’t. These draconian measures had been enacted on me unilaterally. To this very day I’m not entirely certain why. I remember my mother taking us to the Memorial Building to get our polio shots. I also recall the “polio camp” on Plum Island. It was a scary time for parents.